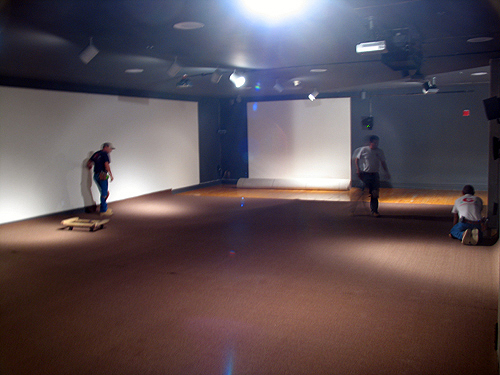 As preparations continue for Nadia Hironaka’s video installation The Late Show, today an outstanding crew from Executive Flooring Systems, Inc, Phoenix is installing carpet throughout the space. See the full video installation for the first time as we invite you to join us for the FREE PUBLIC OPENING RECEPTION this Friday, October 17 from 7-9pm. It also marks the opening of the ASU Faculty Exhibition and rumor has it that an ASU student or two may be organizing a guerrilla performance in front of the Museum that night! Entry filed under: ASU Art Museum, ASU Art Museum: Behind-the-scenes, Nadia Hironaka. 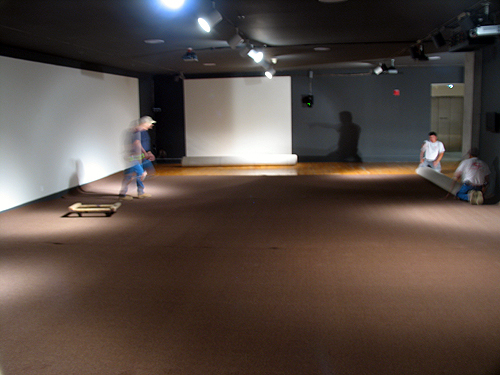 Tags: art, ASU Art Museum, behind the scenes, exhibition, installation, John, museum, nadia hironaka, nadia hironaka executive flooring systems inc. phoenix video installation art, video. JFMLS starts its season! Opening Tonight!